1. The approach path for landing from the East (Rwy 27) has obstructions. Nok Airport has built a tower (now removed) and a hangar on the approach path. 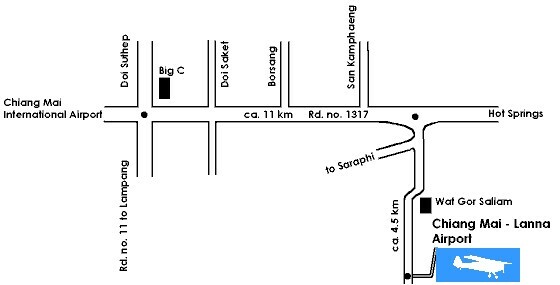 Ban Thi Airport and Nok Airport are 270 meters apart. Please be on the lookout for aircraft when taking off and landing. 3. 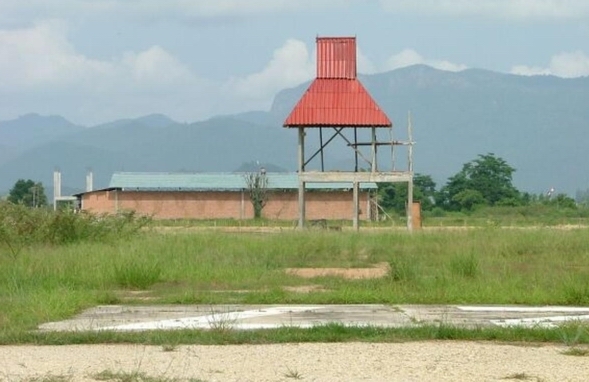 Telephone tower 1.3 km southwest of the runway. The tower is painted red and white and approx. 200 ft high. The tower is no danger for landing or takeoff. 4. Remote controlled aircraft (one is a very fast jet plane) flying approx. 1 Km southeast of the airfield. Please use ONLY a pattern in the north of the airfield for landing and takeoff. Pattern height 1700 ft MSL. Location: VOR CMA: Radial 125*, DME 9.8NM. Activities: "Lanna Flying Club" is called Northern Aviation Services. They welcome local and foreign pilots to come and fly. 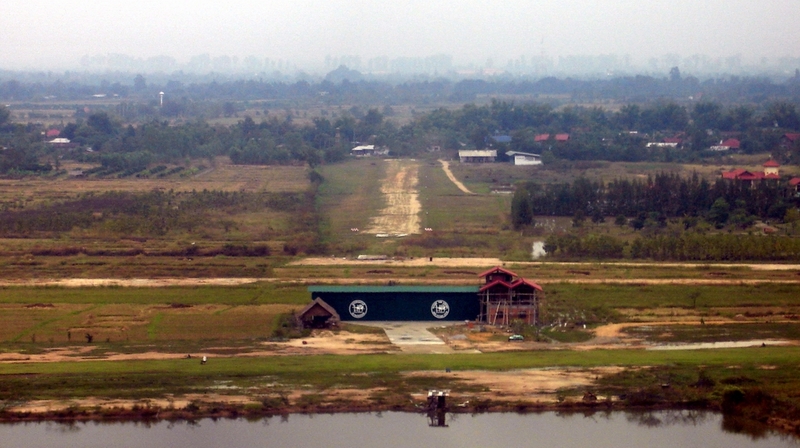 Ban Thi is an Airpark where you can build your own house and park your plane in your house. 3. Telephone to Chiang Mai Tower -- 053277776 -- 10 minutes before takeoff for takeoff clearance. 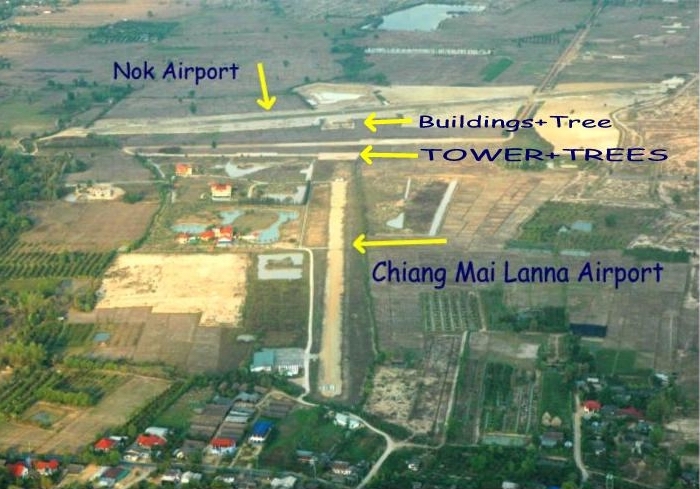 April 2007 News: Some members of SFAT were recently discussing the idea of joining Ban Thi Airport with Nok airport (by extending Ban Thi's runway) to make them both one airport. Since the airports are so close, this would be an excellent way to increase safety and promote General Aviation in Thailand. 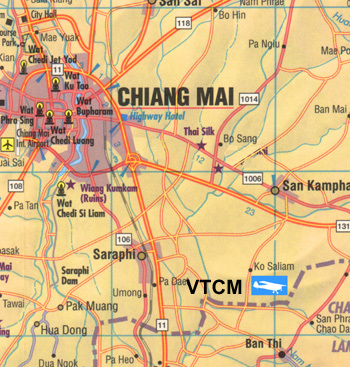 If Ban Thi and Nok were joined, then this would create the largest airpark in all of Asia. SFAT and its members are very active in promoting General Aviation and Aviation Safety in Thailand.